These arm warmers are from Stolen Goat's Orkaan winter range are made from the same material as their bibtights, so you get a comfortable brushed inner surface and a degree of protection against the cold and wet. They have a section of reflective Pixel material which is a great idea, giving some much needed side visibility for night-time riding. Arm warmers are simple tubes of material, available in thin lycra for warmer conditions, or fleecy Roubaix-style fabric for when you need a bit more warmth. They are a really useful addition to your cycling kit, allowing you to head out early when it's still cold and then take them off when things warm up. Stolen Goat offer two sizes, catering (they say) for regular people and people with 'serious guns'. I fall firmly in the former camp, and the medium fitted me fine. I'm relatively tall but they were long enough to work with any of the jerseys I tried them with (I find Castelli's Nanoflex arm warmers a little too long). 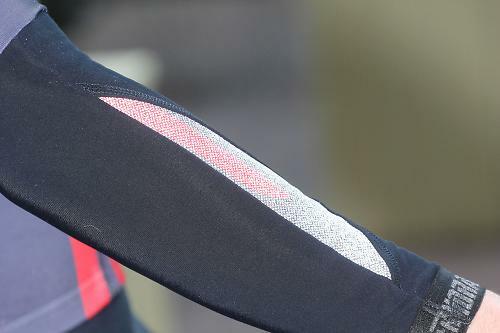 At 425mm long, these arm warmers always stayed safely tucked inside the jersey sleeves, helped by elasticated cuffs at each end with a silicone Bioracer pattern on the inside. They're designed to go with the Race Tech jersey which has quite long sleeves, down to the crook of the elbow, but when I used them with other jerseys with a shorter sleeve they worked just as well, and I never had issues with unintentionally exposed biceps. The brushed inner surface is like that found with various cooler-weather fabrics (think Roubaix-style gear) and feels great against the skin, offering a decent level of warmth. Quite how cold a day you might wear them on will depend on how hard you're riding and also on whether you tend to run hot or cold, but for me, I was comfortable wearing the Race Tech jersey with these down to about 5 or 6 degrees if I was clipping along at a decent speed. It's possible to wear them over a slim-fit base layer if you need a bit more warmth, although it can be a bit fiddly to get them on without the base layer pulling up (as with any arm warmers). The fabric has a built-in water-repellency which should remain in place for their lifetime, rather than wearing off like some DWR treatments, as it results from special fibres inserted at the weaving stage rather than a subsequent treatment (so Stolen Goat tells us). They've been through the wash a bunch of times during testing without any noticeable drop in performance, certainly. They're not waterproof, though, not least because the seams offer an easy route through for moisture, but for days when you're expecting showers, it's great to keep a bit more on the outside. There is a decent-sized sliver of Pixel fabric on both arms, positioned such that it sits on the forearm. Pixel is used throughout Stolen Goat's winter ranges (and has been seen on gear from one or two other brands too) and is a highly reflective material whose inner surface feels like Roubaix fabric and - in daylight - doesn't look like conventional reflective material. It can also be printed on - here Stolen Goat have added a splash of colour and their quirky goat logo. They offer a red and a green version to match their bibtights and the Race Tech jersey. In terms of pricing, the Orkaan arm warmers are on a par with some similar offerings and a fiver less than Castelli Nanoflex, although none of the competition offers the visibility benefits of the reflective Pixel panels, so that's the standout feature. In summary, then, your arms will stay warm and relatively dry if you're riding in variable conditions, and the addition of the Pixel fabric really helps with night-time safety, enhancing your side visibility and helping other road users see your turn signals. Arm warmers are one of the most versatile pieces of kit a cyclist can own. Or rather – they make the rest of your cycling gear much more versatile. Easily slipped on or off as the needs suits, these arm warmers are developed from the same fabric as the rest of our Orkaan range. As such they are wind proof, water repellent and breathable. They also feature a super reflective panel for extra visibility from the sides. In short, they'll keep you warm, dry and safe. With grippy elastic at the top & bottom they won't budge unless you want them too. Available in two sizes for regular people and people with 'serious guns'. Pretty well. Decent warmth and water resistance is about on a par with the competition. The Pixel reflective panels are really reassuring for night-time use.